Unlock liquidity when you need it and on the terms you want, while maintaining ownership of your metal. When you agree on terms with a lender a contract is created and a lien is placed on the metal parcels you choose to use as collateral. When your repay the loan the lien is removed. Your ownership of the metal never changes. We only charge a 0.5% administrative fee. Transferred-in metal can also be used as collateral, so if you store metal at home or with another provider, transfer it to us to obtain a loan. Loans always start on the 1st, 8th, 15th and 22nd of the month, allowing you to roll over funds from one loan to another without downtime. See the Loan Schedule for more details. The next loan payout is on 22 Apr 2019. You might not need funds now, but it is good to know that your metal enables you to have quick, low cost, access to cash if needed. Use your loan to repay higher interest debts such as unsecured loans, credit cards, and mortgages in high interest countries. You can now pay for metal orders with your upcoming P2P funds, even if the loan payout is not until the next Loan Start and is more than two business days away. Just note in the Order Comments section that you wish to use your P2P funds for your metal payment. 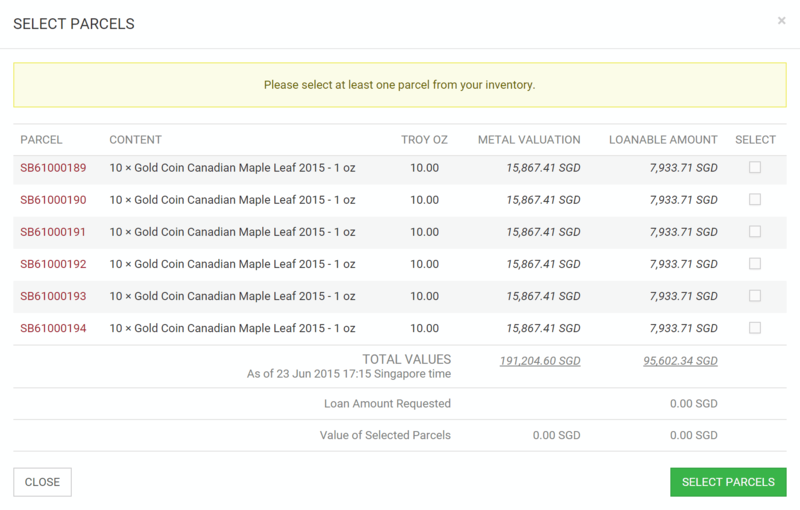 Creating a borrowing request on Silver Bullion is simple and will only take a few minutes. Log into your S.T.A.R. Storage account and set the terms for your borrowing request. 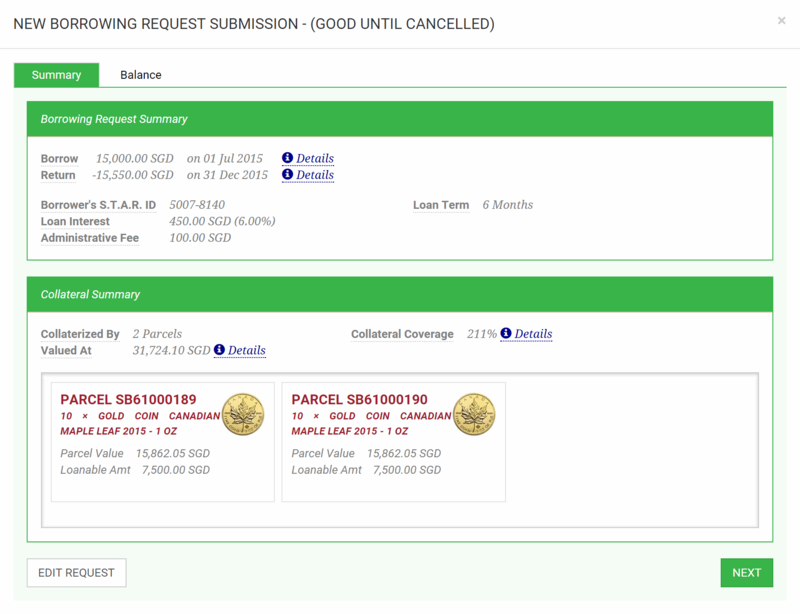 Under the “Valid Until” option, you can choose to have your borrowing request carried forward to subsequent bidding periods until you cancel it or for selected period only, in the event that your borrowing request is not filled during the current bidding period. Decide on the amount that you want to loan, and select the number of parcelps required by referring to the loanable limit. Enter the amount you would like to loan. 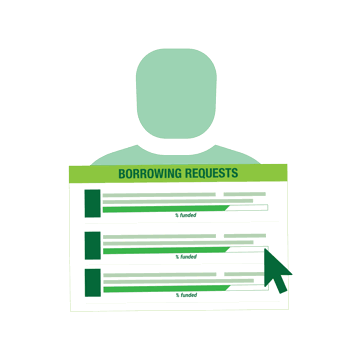 Under the "Valid Until" option, you can choose to have your borrowing request carried forward to subsequent bidding periods if your borrowing request is not matched during the current bidding period. Review all terms before posting your borrowing request. Once you have confirmed and submit your borrowing request, it will be posted on our loan listing page for potential lenders to view. Once your loan request is filled and a legally binding contract between the borrower and lender is created, Silver Bullion will act as an escrow agent to enforce the contract by collecting and disbursing funds between the parties and locking collateral. 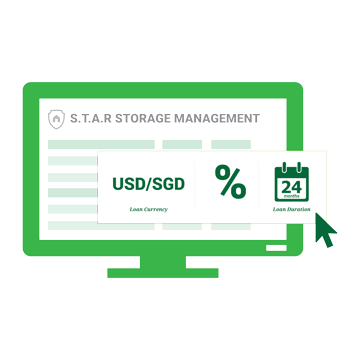 Your loaned amount will become available in your P2P account on the Loan Start date. You can then have the funds wired to your linked bank account, use them to purchase metal or use them for P2P loan purposes. Should your P2P balance be insufficient to cover an interest, fee or principal repayment you will be charged a late fee of 1% of the outstanding amount. Please note that eventual bank wire fees from or to your linked bank account will debited to your P2P account.